Remember that clips in the Session View are launched by their Clip Launch buttons (see 7.1) or remote control (see Chapter 27). Clip launch settings are made in the Launch box. The Launch box only applies to Session View clips, as Arrangement View clips are not launched but played according to their positions in the Arrangement. To view the Launch box, open the Clip View (see Chapter 8) of a Session View clip by double-clicking the clip, then activating the leftmost Clip View Box selector panel. Use the Clip View Box Selector to Bring up the Launch Box. Note that you can edit the launch settings of more than one clip at the same time by first selecting the clips and then opening the Clip View. The Clip Launch Mode Chooser. 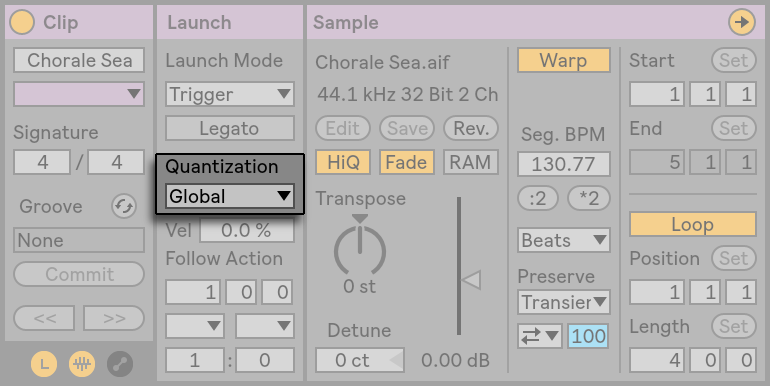 To use the Control Bar’s Global Quantization setting, choose “Global.“ Global quantization can be quickly changed using the CTRL-6(PC) / CMD-6(Mac), 7, 8, 9, and 0 shortcuts. 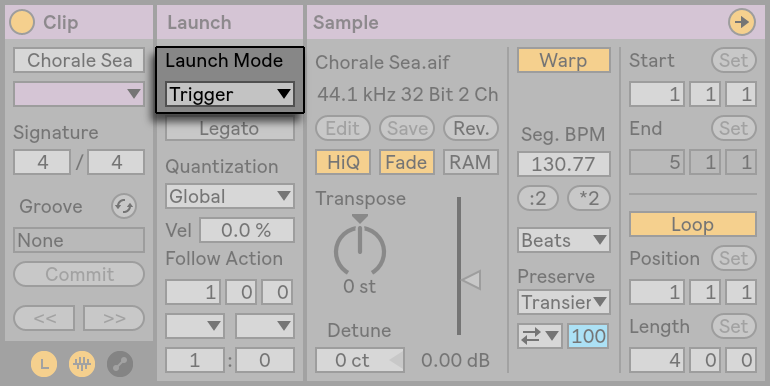 Note that any setting other than “None“ will quantize the clip’s launch when it is triggered by Follow Actions (see 13.6). The Velocity Amount control allows you to adjust the effect of MIDI note velocity on the clip’s volume: If set to zero, there is no influence; at 100 percent, the softest notes play the clip silently. For more on playing clips via MIDI, see the respective section (see Chapter 27). Suppose you have gathered, in one track, a number of looping clips, and you now want to toggle among them without losing the sync. For this you could use a large quantization setting (one bar or greater), however, this might limit your musical expression. Another option, which works even with quantization turned off, is to engage Legato Mode for the respective clips. When a clip in Legato Mode is launched, it takes over the play position from whatever clip was played in that track before. Hence, you can toggle clips at any moment and rate without ever losing the sync. 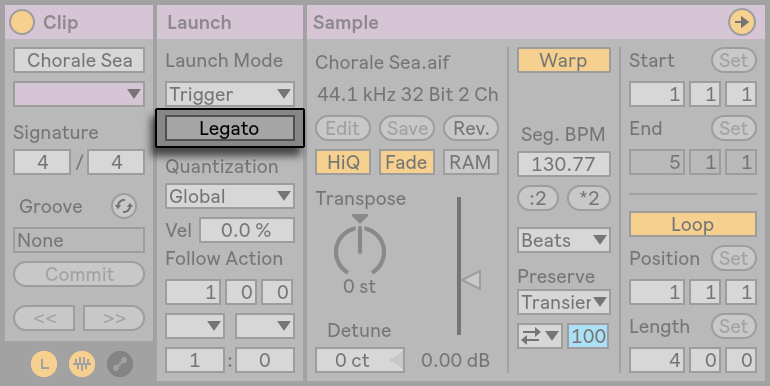 Legato Mode is very useful for creating breaks, as you can momentarily play alternative loops and jump back to what was playing in the track before. Unless all the clips involved play the same sample (differing by clip settings only), you might hear dropouts when launching clips in Legato Mode. This happens because you are unexpectedly jumping to a point in the sample that Live has had no chance to pre-load from disk in advance. You can remedy this situation by engaging Clip RAM Mode (see 8.2.8) for the clips in question. Follow Actions allow creating chains of clips that can trigger each other in an orderly or random way (or both). A clip’s Follow Action defines what happens to other clips in the same group after the clip plays. A group is defined by clips arranged in successive slots of the same track. Tracks can have an unlimited number of groups, separated by empty slots. 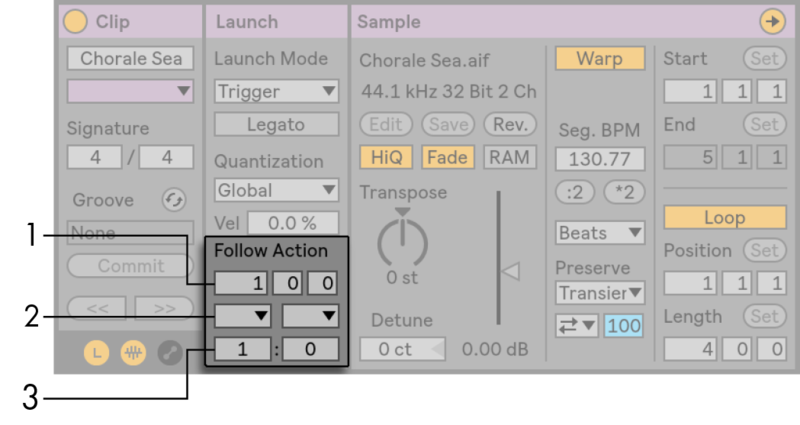 The Follow Action Time control defines when the Follow Action takes place in bars-beats-sixteenths from the point in the clip where play starts. The default for this setting is one bar. The Follow Action choosers allow selecting two different Follow Actions, A and B. The Chance A and Chance B controls set the likelihood of each of the two Follow Actions occurring. If a clip has Chance A set to 1 and Chance B set to 0, Follow Action A will occur every time the clip is launched. As we can see from this example, a Chance setting of 0 means that an action will never happen. Changing Chance B to 10 in this scenario makes Follow Action A occur much less often — approximately once out of every ten clip launches. “Stop“ simply stops the clip after it has played for the chosen Follow Action Time. Note that this overrides clip loop/region settings. “Play Again“ restarts the clip. “Previous“ triggers the previous clip (the one above the current one). “Next“ triggers the next clip down in the group. If a clip with this setting is last in a group, this Follow Action triggers the first clip. “First“ launches the first (top) clip in a group. “Last“ launches the last (bottom) clip in a group. “Any“ plays any clip in the group. “Other“ is similar to “Any,“ but as long as the current clip is not alone in the group, no clip will play consecutively. There is also the possibility to have no Follow Action by selecting “No Action,“ or leaving the chooser blank. Note that a Follow Action happens exactly after the duration that is specified by the Follow Action Time controls unless clip quantization is set to a value other than “None“ or “Global.“ Follow Actions circumvent global quantization but not clip quantization. So why do you need these things? Music is repetition and change. Music based on loops or short melodic fragments has a tendency to sound static. Follow Actions allow you to create structures that will repeat but can also be surprising. Remember that you can always record (see Chapter 16) the results of your experiments, so this can provide a good source for new material. In the following sections we will look at some practical examples and ideas for Follow Actions. Drag the clip into the Arrangement View and make sure that the Clip View’s Loop switch is not activated. Use the Edit menu’s Split command (see 6.11) to split the clip between the non-looping and looping parts. Click and drag the resulting two clips into the Session View by letting the mouse cursor hover over the Session View selector. Drop the two clips into a track. They now form a Follow Action group. Creating a Group With the Two Clips. Set up Follow Actions for the first clip. You will want to make Follow Action Time equal to the clip’s length. Set the Follow Action A chooser to “Next,“ with a Chance setting of 1, leaving Follow Action B alone. Now this clip is set up to advance to the looping clip after it plays. Activate the Loop switch for the second clip. The first clip will now proceed to the second after it has played in its entirety; the second clip will simply play in a loop until it is stopped. One of the most obvious possibilities that Follow Actions open up is using a group of samples to form a musical cycle. If we organize several clips as a group and use the “Play Next Clip“ Follow Action with each clip, they will play one after the other ad infinitum, or until we tell them to stop. Cycles can be peppered with occasional rearrangements through the addition of other Follow Actions, such as “Any,“ with smaller relative Chance settings. There are some interesting applications of Follow Actions when it comes to creating temporary musical loops. The default setting for Follow Action is actually a 1:0 chance that “No Action“ happens after the Follow Action Time, which means that there is effectively no Follow Action. But now, imagine a group consisting of one single clip. Follow Action A is set to “Play Again,“ with a Chance of 8. Follow Action B is set to “No Action,“ with a Chance of 1. 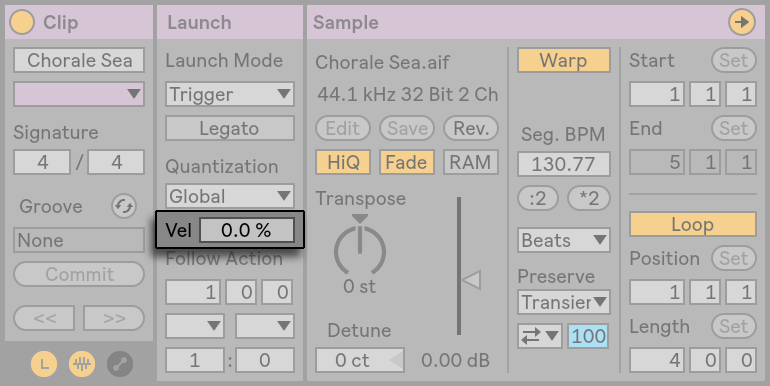 The clip uses a long sample, and Follow Time is set to one bar. Clicking on the clip will play the first bar, after which it will be very likely that it will play the first bar again. However, after a few repetitions, it will eventually come to Action B — “No Action“ — and continue playing the rest of the sample. Or, a clip can be played from its start to a specific point, when its Follow Action tells it to “Next.“ The same file can be used in the next clip in the group, but this one can be set to loop. This second clip can have any manner of Follow Action settings, so that it might then play forever, for a specified time or until random chance leads to the next clip in the group. Paired with clip envelopes (see Chapter 20) and warping (see 9.2), Follow Actions can be used to create all sorts of interesting variations within a group of similar clips. 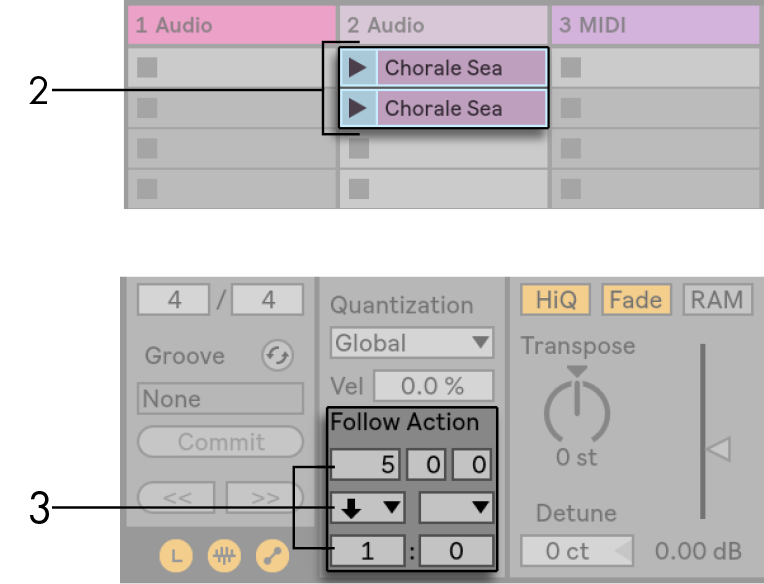 You could, for example, use Follow Actions to randomly trigger clips with different MIDI controller clip envelopes, so that fine variations in pitch bend or modulation of an instrument or synth could occur as the clips in a group interacted. Audio clips could morph between different effect or clip transposition settings. Using Follow Actions and Legato Mode together provides a powerful way of gradually changing a melody or beat. Imagine that you have several identical clips of a melody that form a group, and they are set up to play in Legato Mode. Whenever their Follow Actions tell them to move on to another clip in the group, the melody will not change, as Legato Mode will sync the new play position with the old one in beat-time. 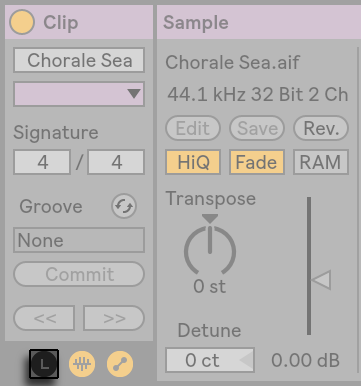 The settings and clip envelopes of each clip (or even the actual notes contained in a MIDI clip) can then be slowly adjusted, so that the melody goes through a gradual metamorphosis. You can let Follow Actions perform unpredictable remixes and solos for you: Use a clip containing a beat or melody, and copy it so that there are several instances of it forming a group. Alternatively, you can use several different beats or melodies that you want to mix together. The start and end (see 8.2.2) for each clip can be set differently, as can clip envelopes (see Chapter 20) and other clip settings. As long as Follow Action Time in each clip is equal to the length of the clip that you want to play, you can set up two Follow Actions with different Chance values in each clip, launch a clip, and surprise yourself. Follow Actions are great when it comes to sound installations, as they allow you to create structures that play for weeks or months and never exactly repeat. You can set the Follow Action Time controls in a series of clips to odd intervals, and the clips will interact with each other so that they never quite play in the same order or musical position. Remember that each clip can have two different Follow Actions with corresponding Chance settings... have fun!